Successful private companies benefit from having effective boards of directors. They protect the interests of shareholders — the company’s owners — by hiring and supervising top management, establishing performance standards, and setting management pay. Boards also appoint auditors to scrutinize the books, ensuring transactions and balance sheets are fairly reported. Investors nominate directors and change corporate bylaws, improving management accountability and tying executive compensation to results. Weak corporate governance can allow companies to become dominated by managers, who may put their own interests first. There have been substantial advances in shareholder rights, many led by “activist” investors (aggressive hedge funds, private equity players and motivated institutional investors). They recognize under-performers and purchase ownership stakes to wrest control from lackluster managers, forcing reallocation of assets to more profitable uses. They keeps companies on their toes. No such remedies exist in the slow-moving government world of Crown corporations. Directors are political appointees, their interests aligned with the political regime of the day. Some have technical, managerial, directorial, and/or financial expertise, but the main criterion for appointment is loyalty to the political party that put them there. With Crown corporations’ executives, compensation is not based on share price performance and stock options: there are no shares to trade. Crowns can have weak, conflicted and nebulous goals — its sole shareholder, a government with political objectives. Crown executives have little risk of being fired for poor financial performance, but the best executives may look elsewhere for challenges. Non-taxable and having access to lower-cost government debt funding, the cost of capital for, say Hydro, is lower than for private sector companies. Equity capital is, incorrectly, viewed as “cost-free.” A very low rate of return on assets is the expectation. Like private investors, taxpayers deserve much better. Crown directors and executives have low personal liability; legislation protects them from being sued by ratepayers. So, dismal returns and errors of judgment can be perpetuated indefinitely. While customers/ratepayers are milked, taxpayers’ money is locked in investments that abysmally underperform those in the stock markets. Even worse, politicians and their bureaucratic underlings actively meddle in Crown corporation strategy, reducing profitability and risking financial boondoggles (Keeyask, BiPole, Wuskwatim). Crown corporations are inherently backward-looking, seeking to protect their political masters/owners. This is unhealthy because Crown firms (including insurance, gambling and liquor, power utilities) operate in complex industries with technological, legal, regulatory, market change and political risk. Sluggish Crowns hesitate to adapt to market changes. Taxpayers and ratepayers (customers) should not be exposed to such risks, entire “investments” can be lost. Worse than not-so-benign neglect is the empire-building and social-political goal-seeking that provincial politicians have done with various provincial power companies. Or, Ottawa’s blundering in a number of specialty state-owned firms (especially import-export and business development lending). Politics inevitably over-rides effective Crown corporate governance, and time and time again fails to stop new disastrous, costly, so-called investments. Real accountability plus better performance for citizens and taxpayers will happen only if the Crowns are sold to private investors with real incentives to reform and re-direct failing fatally-politicized organizations. The public interest is better served through laws and regulation, not political business enterprises. — Graham Lane and Ian Madsen. Graham leads Manitoba Forward, www.manitobaforward.ca. Blaine Pedersen, still a PC cabinet member after Pallister’s shuffle, recently engaged a lawyer to carry a message to family farmers dispossessed by Hydro’s BiPole lll expropriation. It suggested better terms were on offer. The only takers of that offer appear to be Pedersen’s own brothers. Ironically this came after a private member’s bill tabled by Steven Fletcher, which would have tightened up conflict of interest rules for MLAs, died on the order table. Did Brian Pallister know Pedersen would give his brothers an opportunity to better their deal on the expropriation of their farmland? Did Pedersen oppose Fletcher’s bill when the PC caucus discussed an upgrade of conflict of interest law to cover MLAs’ families? Was Fletcher’s pursuit of tougher conflict of interest rules a factor in his turfing from the government party? Pedersen, who is no more the Infrastructure minister, promoted a lawyer representing Manitoba’s largest power users at PUB hearings to suggest a better deal could be arranged for the farmers. Before the election, Pedersen opposed Hydro expropriating land to build Bipole III through the Red River Valley. After the election, the new government — with a seemingly mute Pedersen — allowed Hydro to plow through the prime farmland. Pre-election, Pedersen promoted a landowners group to fight Selinger’s BiPole expropriation, but in power he now seeks to undermine it with his handpicked lawyer. Was bullying Fletcher out of PC caucus, without even allowing him to go to bat for the group, done to gag him? To close the books on changing a weak conflict of interest law? Surely, Fletcher in caucus would have rung the alarm before Pedersen made his conflicted pitch. Fletcher’s proposed bill, entitled The Conflict of Interest Act, never made it to second reading and a review by Legislative committee. Fletcher’s discarded Act provides much more protection from insider deals than the current Act. His bill would extend the prohibition to family members of MLAs gaining through MLA “insider” actions. Now, there is nothing to prevent gains by family members brought about by a MLA. Avoiding perceived and actual conflicts of interest are of significant importance to the assurance of fair, workable and corruption-free provincial government. The provincial government is a major component of our Manitoba society. Not only do those who sit in cabinet and in the Legislature establish laws and manage a budget of $14 billion, but also control the policies and major actions of monopoly Crown enterprises. Accordingly, those who sit in the cabinet of the government should act in the public interest, and never for the financial gain of themselves or their extended family. Pedersen’s questionable gambit follows four years of Hydro refusing financial fairness for BiPole afflicted family farmers. His brothers stand to gain if Hydro’s offer jumps. And why wouldn’t it — otherwise why bring in a new bargaining agent, one well known to government? An ugly spectre of conflict of interest yells out. But without Fletcher’s upgraded conflict of interest law. Why not? The whole affair, from throwing farmers under the bus to handpicking legal help, potentially to benefit family, and thwarting enhanced conflict of interest legislation, suggests Pallister’s regime needs watching. Note from Graham Lane: Muskrat Falls is yet another example of government missing the market and wasting billions, to the cost of ratepayers. The Manitoba Hydro debacle has many of the features of Muskrat Fall’s folly, but is an even bigger waste. A LOT depends on the convoys of lorries now rumbling through the rugged interior of Labrador in eastern Canada. They are carrying equipment to be installed at Muskrat Falls, a hydroelectric project on the Churchill River. The 824MW dam, scheduled to begin operation in 2020, is supposed to reduce Newfoundland and Labrador’s dependence on fossil fuels and produce a surplus for sale to neighbouring Nova Scotia. But it is shaping up to be the latest in a long series of failed schemes to improve the economy of Canada’s slowest-growing province. In June the provincial government revealed that the project, including a transmission line to Newfoundland, would cost C$12.7bn ($10bn) to build, more than double the original estimate of C$5bn. To pay for that, electricity rates will nearly double to 23.3 cents per kilowatt hour by 2022, twice what Canadians now pay on average. Indigenous groups that live near the dam and other people downstream worry that rotting vegetation in the reservoir will release mercury and that the construction convoys will damage roads. Three Inuit protesters were arrested in July for blocking the lorries. Ever since Newfoundland and Labrador joined Canada in 1949, con men and credulous politicians have pushed misguided projects to reduce its dependence on natural resources. Joey Smallwood, the province’s first premier, put public money into more than a dozen ventures that went bust, including a rubber-boot factory, a cotton mill, a chocolatier and a “high-end” knitwear-maker. The Come-by-Chance oil refinery, which cost taxpayers C$42m, declared bankruptcy three years after it opened in 1973. A hydroponic cucumber greenhouse, popularly known as Peckford’s Pickle Palace (for the premier who backed it with C$22m of taxpayers’ money), went bust in 1989. The history of failed investments has left the province’s government with Canada’s biggest public debt as a share of GDP. Wayne Johnston called his novel about the province, published in 1998, “The Colony of Unrequited Dreams”. Churchill Falls, upriver from and much bigger than Muskrat Falls, is the biggest nightmare. A private firm, the British Newfoundland Development Corporation, built it on time and on budget and sold it in 1974 to the province’s government. The problem is the contract that the government signed with its neighbour, Quebec. It obliges Newfoundland and Labrador to sell electricity at C$2 per MWh, a fraction of its current market price, until 2041. The arrangement, which Newfoundland and Labrador agreed to in part because Quebec was the nearest customer, will yield a profit of C$26bn for Quebec’s government, which sells electricity to the United States. Newfoundland and Labrador will pocket just C$2bn over the life of the project. The province has tried repeatedly to break the deal in court and lost every time. Canada’s Supreme Court will hear an appeal, the third to the highest court on various aspects of the dispute, later this year. None of these ventures freed the province from its dependence on commodities such as lumber and iron ore and their volatile prices. Over-fishing caused the cod industry to collapse in 1992. Offshore oil production, which began in 1997, sustained the economy until 2014, when oil prices plunged. At the same time, thousands of unemployed oil workers returned to Newfoundland and Labrador from Alberta, where an energy boom had also ended. Tourism and a small tech industry are doing well but cannot make up for the oil slump. Whereas Canada is expected to grow faster than the rest of the G7 group of rich countries this year, Newfoundland and Labrador faces its second year of recession. Its unemployment rate is 14.9%, more than double the national average. Wade Locke, an economist at Memorial University in St John’s, the province’s capital, calls the economic situation “desperate”. 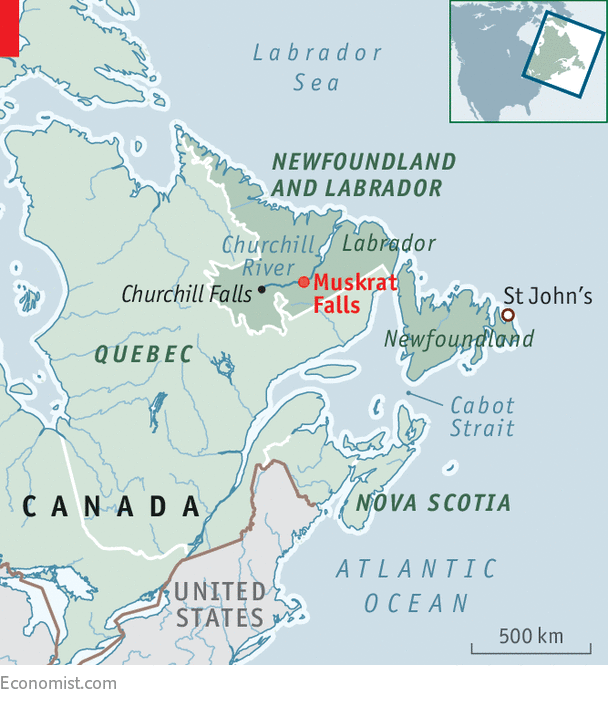 Muskrat Falls is the latest attempt to diversify out of commodities and jump free from the “geographical stranglehold of Quebec”, in the words of Danny Williams, the Conservative premier who authorised the project in 2010. A transmission line now being laid under the Cabot Strait will carry some of the surplus to Nova Scotia, bypassing the French-speaking province. Then it will pay off, Mr Williams insists. Critics say that the former premier ignored cheaper options for producing power. Dwight Ball, his Liberal successor, calls Muskrat Falls “ill-conceived and reckless” and promises to conduct a forensic audit after it opens. “There’s a lot of lessons to be learned from the way [Newfoundland and Labrador] went about this,” says Dennis Browne, the province’s consumer advocate. He thinks it will learn from its mistakes. History suggests otherwise. The Public Utilities Board has upped Hydro rates again, this time by 3.36%. Since the first phase of Hydro’s costly expansion — the building of the money-losing Wuskwatim dam — electricity rates have jumped 50%. Anyone happy that the latest rate hike wasn’t worse should give their head a shake; the “worse” is still to come. The latest rate hike was only provisional, Hydro still seeks rate hikes of 7.9% a year for five straight years. PUB’s verdict on that plan will follow a longer hearing later this year. The truth is that Hydro may end up seeking even higher hikes than sought so far. Make no mistake, Hydro is in rough condition — mostly because of the NDP’s handiwork, but Pallister hasn’t helped either. Major issues were not even touched upon in the latest Hydro-PUB get together —particularly whether the government should accept its responsibility for the $25 billion boondoggle rather than profiting from it. Also, nothing much was said about the impact of the much higher rates to come on lower-income households, households heating electrically, and northern communities. Will large industry stay and expand if rates go sky high? And, still no call for an inquiry. If there was ever a case where a public inquiry is needed, it is for this screwed-up monopoly run by incompetent politicians assisted by weak Hydro managers and compliant board members. As for PUB, its members were appointed without an open competition by a government that can shed them without notice; now serving at the pleasure of Brian Pallister. If you think PUB is in the corner of beleaguered ratepayers, think again. If Hydro was a private utility, it would be broke. Private shareholders would take the hit, not ratepayers. No competent and independent regulator would make ratepayers pay for all the blunders. Private shareholders and bondholders would be made to pay for the utility’s mistake. Then, the utility would get a new owner to pick up the pieces, and for an economic price, rates would not escalate. What we are watching is a play, the script fashioned on Broadway, Hydro’s Portage mega-palace headquarters, and PUB’s hearing rooms. Millions are regularly spent in PUB hearings, great billings for lawyers and consultants. Billions have been wasted on dams and transmission not needed for a quarter of a century if at all. Hundreds of more millions have gone down the drain inducing First Nations to enter into so-called partnerships — Hydro runs the show, entirely. And, for the First Nations getting no-risk gifts funded by other ratepayers, along with expensive sole-source contracts and more — remember, they are customers just like every else. PUB plays ringmaster, contributing to the fiasco by dutifully aiding the manipulation of Hydro’s books through regulatory accounting games. We, ratepayers, are innocent lambs awaiting fleecing. The opposition is quiet. We can understand the NDP’s silence, also that of long-gone Hydro executives and past board members. But, where are the Liberals? I guess being in the midst of a leadership contest and having only three seats in the Legislature makes it tough to defend taxpayers and ratepayers. Are we left with newly-minted independent MLA Steven Fletcher, tossed by an insecure Pallister, to call it straight?